Our parish Christmas has begun beautifully. On Tuesday and Wednesday St Joseph’s Table provided a delicious Christmas dinner in the tastefully decorated hall. The mood was festive and homely, the atmosphere warm and friendly and the compliments were many. The Lourdes Garden has been given its Christmas preparation and is ready for our Carols by Candlelight on Wednesday of this week at 7.15 pm followed by a concert of fun and games in the parish hall. This is always an enjoyable evening. Please feel welcome to come even though we know there will be many here. The Carol Service and entertainment blend perfectly. On Monday 18th December we shall have “Mother Mary” in the church, the telling of the Christmas story by the wonderful group from SPANNED, our diocesan society for people with special needs. Do come to support them, to enjoy the Christmas story told in a different way, to sing some of the songs that you will recognise from ABBA with new Gospel-inspired words. On Wednesday 20th we have our Penitential Service on the model of the celebration in the Catholic Cathedral in Sheffield every Advent and Lent. Unspoken confession and sorrow open us to the Lord together, just as we are able to communicate with each other in silence full of meaning. Saturday, Sunday and Monday complete our prayer – see details over the page. 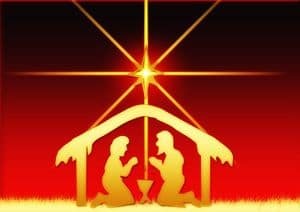 We share a prayerful blessed Christmas. Then a new year to look forward to, praying for the politicians involved in bringing peace and justice wherever they have the power and influence. We look sadly at our world of North Korea, Yemen, the Middle East, the Horn of Africa and many parts of the world where there is suffering and need. We pray for and with the good people able and willing to help and we ask God the wisdom and compassion to be involved.